Before you make a decision, you should consider the serious flaws of Trex decking. I can show you photos that will make you weep. In 2007 I installed a very extensive Trex deck (deep red color). Within 6 months I had black mold covering the entire surface. (I previously had a wooden deck that never had mold problems.) This deck gets so hot in the sun that we cannot walk barefoot on it. We have to lay runners for the dog to get from the yard to the patio door! The mold is very difficult to remove and it looks disgusting. We tried the Corte-Clean Composite Deck Cleaner (recommended by Trex as a eco-friendly, non bleach product). It is extremely labor intensive and it must be done every few months. The floor of the deck is now light red streaked with white (and specks of mold) while the rails remain deeper red. You don't even want to lean against the top of the rail or set your beverage on it because of the scary mold. If my contractor had spoken the truth about Trex, I would have replaced my deck with another wood one. Staining a wooden deck once a year no longer seems like such a burden. I'll gladly wade into the problems with Trex decking. See the attached photo that should open eyes regarding the rotting that takes place. My 1700 SF deck is 4 years old, and 10% of it is now worthless. I expect the rest of it will follow shortly. Having read a lot of the postings regarding the problems folks have had, I now completely understand why wood has to be the material of choice. It has a few centuries of historical usage, and I'm inclined to return to something that is at least predictable. Keep up the fight, don't let anyone tell you otherwise. I hope this information helps. Hi, I've created the following website to showcase issues consumers like yourselves are having with Trex decks. Please stop by and share your stories and photos. I have not seen such a bad mold infestation as you before. I am pretty sure that you should not attempt to remove it yourself. Now I know not to use Trex too. Thanks for the post! I would recommend you call a mold removal company for such circumstances. Our trex deck is covered in mold also. It is 3 years old this year. We have cleaned it every year according to the trex guidelines and it seems to just get worse every year. Wish we would have never purchased it!! I thought thta the mold was just a isolated promble. How last week when I was at Home Deport turning to find a product to clean my deck.I was informed that there is a promble with molding on the trex decking materials. I'm really angry. I spent lots of money for my deck. My deck has mold, white spots ,and fadind. Sorry about all the problems. But I thank you for the info. Was going to by Choicedek and read the nightmares, and then read about Trex here ... I guess it is going to be wood decking and a good stain and seal to protect it. Currently wrestling with Trex "specialists" about white spotting on my mother's Trex benches and railings. She replaced her 1980 wooden ones in October 2007 with Trex Accent in Winchester Gray. Looked great, weathered nicely until this year, when virtually every horizontal and vertical surface developed white spots. Unlike other posters here there's no sign of black mold. I washed off a year's worth of pollen and dirt with the officially recommended mild dish detergent, medium-soft bristle brush, and water from the garden hose with one of those extra pressure nozzles on it. Hardly a power wash by any stretch of the imagination. After waiting through 3 Customer Service calls I was referred to a so-called Specialist, who at least gave me an e-mail address to send the photos to (I had taken some with my cell phone). Despite his assurances that I would hear from someone promptly it's been 24 hrs. and no response, not even a courtesy email to let me know who had received mine and was working on it. The white spots disappear when the Trex is wet but reappear when it dries. You can't feel them as being any different from the rest of the surface with your finger or fingernail. They don't seem to be ON the Trex so much as part of it. Still waiting to find out if we can power wash this Trex Accent or not; online advice is conflicting and none of the techs I spoke with yesterday could figure it out without "more research". Meanwhile, the same year my mother had her Trex Accent built, we had our deck railing tops replaced with Evergrain. None of the contractors I interviewed for the job would touch Trex, and the Evergrain is still performing as advertised. A light wash once or twice a year (by hand & brush or garden hose & brush) cleans it up nicely, the color fade was no more or less than advertised, and there's been none of the cupping and warping in the hot CA sun that we had with the wooden rail tops. Absolutely NO mold, moss, or anything of that nature even underneath. Both our Evergrain and my mother's Trex are under oak trees, so if the white spotting was caused by tree resin it should have turned up by now on our Evergrain in CA. Photo shows a portion of my mother's bench. This decking is HORRIBLE. I don't even know how they can stay in business and continue to sell the product as it is not a sound or quality product. They do not offer much of anything in the way of of mitigating the wrong they have created. A reputable and ethical company would have a conscience and try to maintain public relations by rectifying the issue as well as offering to replace decks created out of their severe negligence. By the company offering a pittance to those of us that spent a great deal of money on their product in good faith that they would stand behind their product, they have failed us all both ethically and financially. They should be banned from all home maintenance stores, a total RECALL should be made and they should be forced to make right their wrongs. My new deck ended up with a few spots where caulk got into the grooves. There is also a misting of overspray in a few spaces. Fired the painters & need to remedy the situation. I have had Trex for 8 years and only had to clean it once. NO MOULD OR MATERIAL FLAWS. I live in the southeast maybe it is the area of the country or framing material causing the problem, I used pressure treated wood for the framing. YES it does get hot but the no labor or staining every two years sure beats labor. Well that settles that......no way am I buying Trex for my deck. Thank you all for the feedback. I live in Oregon and the block spotting appeared after only 1 year. I've tried bleach & mild cleaning products but they don't do much to help. The deck looks cleaner, but the spots still persist. What cleaning products work best? This is a new home with a 10 year warranty. Has anyone successfully gotten coverage under that warranty? This helps me make up my mind NOT to go with Trex decking material. Too many mold issues to suit me. Thank you all for your time in delivering a loud message to those of us seeking to make life a little easier with our outside living spaces. I was in the process of putting together my materials list for a Trex composite deck when I found this thread. I feel bad for those of you that have experienced these issues, and I am grateful that you shared your stories as well. Are these issues isolated to the Trex brand or is this common with composite materials? I have to rethink my approach. Thank you all for posting about the molding issues. Like so many others, I am looking to replace my deck...but won't be doing it with Trex! Thank you all for your posts I will not be using Trex for my new build in the middle of the base and railing supports Thank you all again and sorry for your loss this stuff is very expensive . I've had tree deck for 7 years. No mold but mildew in shade areas. I have had success with power wash but would like a coating if it is available. Can you recommend anything to alleviate the problem? Glad I came across this site. We were going to use Trex Deck for our porch but after reading these reviews we definitely will not. Thank you all for sharing your reviews! My Trex deck is two years old and has the same black spotting that's been referenced here. Nothing I've tried has helped remove this problem. As a retired widow, I just wasn't able to maintain my original wood deck. When I contacted Lowe's about a Trex replacement, I really thought twice when the price was quoted (I could have bought a car for the same cost). I which I had known about this site before my purchase. Don't think I'd have gone through with it. Doesn't anyone make a reputable product anymore? Is the Trex mold problem an issue in Southern California? Perhaps it is only in wetter, cooler areas of the country? will a solid color stain prevent mold problem? No problems yet after a year...it has faded slightly (tan to lighter tan), but no mold. It is very hot to walk on but what deck isn't when it's 90+ degrees? It was expensive so i hope it lasts! Sorry gang...this is not just a local issue...I'm in SW Ohio. My Trex deck, which looked wonderful in 2011 is now quite spotted with the mold. We did a light powerwash back in April of this year and everything looked great again for about 6 weeks. The mold is back with a vengeance. The Trex folks are as unhelpful as ever with the common response to me that "mold happens". Nope, not accepting that answer, and yet, here I am with a moldy deck. Add me to the list of folks that say, "Had I only known, I would have never purchased Trex Decking". In my case, about $12K down the drain for an inferior product with almost no recourse to remedy the situation. It's been 2 years and we have had continuous black spots. I have cleaned it at least 3 times each season. $20,000 worth of decking and Ispend more time on it than I did on my wood deck. How can they c0ntinue to sell this. Bought a home about a year ago owners never disclosed an issue with the Trex deck. Then received letter in mail from Trex that they had been notified and never filed a claim. I don't have the mold issue so much as the flaking and warping. Had a few boards really swell up and they had to be removed and shaved down. Surface is uneven. We have had our trex for many years and it molds every year. We pressure wash it every year. You have to be very careful not to get to close or you will shred the decking. I like the product but would only use it if you have no shade. Purchased Trex decking in 08. Mold problems began one year later and has spread ever since. Cleaned with soap and water, pressured washed and used a composite deck cleaner all with negative results. Also the color has faded on decking. I have spent less time maintaining my wood deck than my Trex deck and I`ve had my wood deck longer. I am very disappointed with this product. When I contacted Trex all I got was a list of more chemicals that I can spend my time applying. I do not recommend this product it is not worth the extra money. Clean with bleach using a strong solution in a bucket, 1part bleach to 1 part water, use a deck brush on an overcast day, keep it wet for at least a half hour or longer before rinsing it thoroughly. Then paint on a deck paint, Benjamine Moore and others have them made to cover all decks. I bought a house w a trex deck. I don't know when it was added. But I have mold and not happy. I live in Mass. my trex deck is ~5 yrs old and is being consumed by this mold- the white railing-as well as the floor boards. One post covering (at the base of the railing post) turned completely light grey (the deck is brown). I have used vinegar -soap- am considering power wash??? It is very, very discouraging. I do not live in a humid climate where mold is a usual problem. I live in Ohio and replaced a wooden deck with Trex Choice Deck. I thought i could reduce the maintenance of the wooden deck but never that the Choice DEck by Trex would be so terrible with black spots and fading. Complaints to Lowes and Trex have brought absolutely no satisfaction. Replaced old wooden deck with Trex 3 years ago and the last 2 tears nothing but mold spots and now green discoloration on 6 boards.Have spoken to both Lowes and Home Depot and they know about the problem,but state it is Trex manufacturer problem.My question is why do these 2 stores continue to sell this joke of a product.They know and will not tell the consumer full disclosure of the flaws Trex has with molding. I have green mold and black mold. I was told that the black mold will come back even after I clean the deck. They have recommend to stain the deck and the black mold won't come back. Are they right? Will never buy Trex again? Does anyone know where to find the tree marking to prove it is Trex? I have a trex deck for over 8 years and have never had any issues with it. The color is still good and I have never seen any black mold on my deck. Considering I live in the pacific NW and my deck faces north I don't I understand why so many people are having mold issues. Mold and moss grow everywhere here, except my deck! I am also having these unsightly problems and now I am stuck with having to probably replace the junk. But I really cannot afford to do this so what do I do. It was suppose to be the thing of the future so we got it and now it is a total zonk!!!! Will deck varnish after pressure washing the deck help at all?? I am a deck builder and have given Trex an F Grade. There are many problems you have installing Trex. Major cutting labor of the railings. Non or Hard to fit assembly of the railings. Curled floor boards. Cheaply made hidden fasteners that break every other one when you try to screw them in. I would not install another Trex deck unless I got paid per hour. It takes alot of time to assemble there railing kits and install them. my husband is in the process of replacing a 2500sq deck by himself because of the flaking issue....we received the letters for the rest of our decks from trex about the mold...we have ranch with six homes on it....we wanted low maintenance and now it looks like a nightmare ....it is overwhelming at this point!! Have you evaluated the "new and improved" Trex that was showcased at the 2013 Builders Show in Las Vegas? The CLAIM it is the MOLD resistant one... Appreciate all the information, I was pondering resurfacing my deck but with all the mold problems. I have likely saved myself roughly $10K. Thank you. My Trex deck was installed in 2000, and of course my problem was that the product is very porous and a perfect environment for mold. 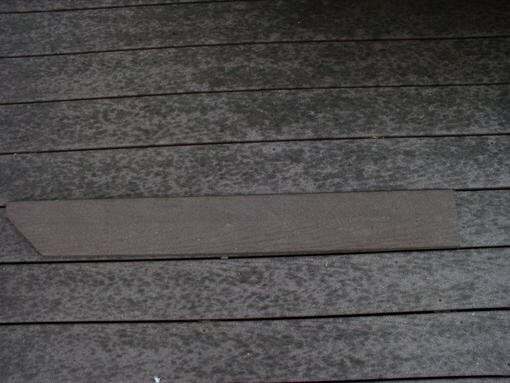 Despite bleach and cleaning agent applications two to three times per year, every time it rains the mold spots are instantly obvious over the entire deck surface. Trex customer service has been terrible. They denied my claim application in 2008, and because my deck was installed in 2000, I am not eligible to be part of the current Class Action Lawsuit, which only covers decking installed starting in 2004. I have never gotten an explanation about why that date was used, especially since the older version of the product is likely more defective. Out of principle, though I doubt their product is much better now, when I finally can afford to replace my deck it will not be Trex. My only other option is to remind people about the product and company's performance as a predictor of future performance. I have a trex deck only three years old spent several thousands dollars and it is covered in brown spots, looks horrible and when I contacy trex they send me a brochure advertising trex and what a warranty covers but no solution on how to get mold off..What to do! I use straight bleachon my trex to kill the mold,my brown trex is now gray but i sray it with bleach 3x a year lokks better than the pictures im seeing. Its 10 years old. I installed a Trex deck and screened porch in 2003. Have had problems with it crowning, cracking at the ends of the boards and, of course, constant mold spots. I have tried Corte Clean and Concrobium Mold Eraser with limited success. 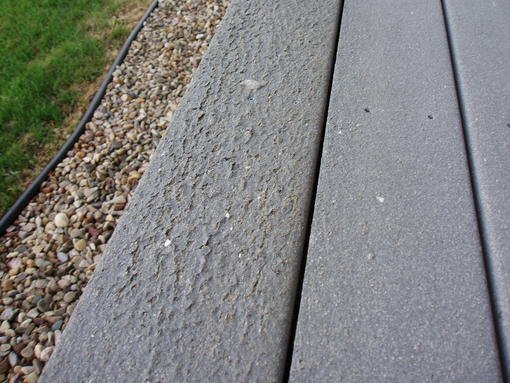 The decking needs to be cleaned at least 3 times per year to control the mold. I did file a claim against Trex and after 6 months of fighting with them, and with the involvement from the BBB and NYS Attorney General's office, Trex gave me 22 20' boards of replacement decking but refused to install it. Would never buy it again. I bought tree also back in 2004 and replaced a 48 ft x 22 ft wood deck with TREX because of their claims of how good it was. Within 1 yr. it started to stain (even with just plain water) and it was getting mildew . I did the cleaning per TREX instructions. Labor intense and then it starts all over again. As to the flaking issues. I sent pictures to TREX but told them it wasn't flaking I was noticing but staining/fading and mildew. They told me they would pay for new material (of course only $330 for labor). Hello! I have a big deck with steps and on the side of a hill. Who made money on that class action suite? And did it really benefit any of us that installed this terrible product. SO afraid to replace the whole deck and end up problems, I did only part of deck, and that new portion is staining too. AND now the old deck which wasn't really flaking at all back then is disinergating right before my eyes with grey powder getting air born and on everything. Is this going to be another health and safety issue like "asbestos " was? And what about my health?? I am coughing more and have this lump like feeling in my throats. Yet when I call TREX and tell them my concerns their answer is "we gave you new material so that case is closed. "Spend your money consumers and hope for the best". Good old capitalism and good old attorneys who are there for who? IS THERE NOTHING WE CAN DO ABOUT THIS ISSUE SO MANY OF US ARE HAVING. The labor alone for the deck my size (48 ft x 22 ft) is over $3,000 alone. DO we have an recourse any more as consumers? And has anyone looked at Health and Safety issue of this product?? Wow I'd like to know if my grandchild is safe playing on it? We to spent a lot more money to ensure we wouldn't have to fuss over the deck. My husband Jim has MS so guess who has to upkeep the deck? I would love to enjoy my decks without being reminded they need another cleaning ,or wow how all flu they look. I want the enjoyment trex offered and my deck to be better than new. Has any out there been able to get trex to do this? Great! I sure wish I had read this before I replaced my deck with Trex a little over a year ago. I do not yet have the mold problem so that's something to look forward to. I have some boards which have faded to almost gray from the saddle color so here and there I have a really light board. It looks terrible. Trex told me I qualify for their class action law suit which could get me a minimum of $20 to a maximum of $150! Seriously? I spent thousands on that deck. How are they still in business? This is my parent's Trex deck, after about 7 years. The entire thing will need to be taken down before this summer, as it is now probably not even safe. It started "crumbling" after about 1 year. My Trex deck is less than 2 yrs old. It is spotty from mold issues and the color has faded tremendously. The warranty of 25 years is not worth the paper it is written on. Since, there is a class action lawsuit going on, in which I didn't know about until a week ago, I do not have the option to opt out. Trex is offering practically nothing for compensation. This is the second class action lawsuit since 1992. How can this company continue to sell defective products and get away with not abiding by their warranty and continue to false advertize. We moved into our house nine years ago with new Trex. We are now on our second installation. Trex provided us with materials since it was flaking and was no longer the saddle color. Of course, we had to pay for installation AGAIN. The people are rude from Trex, the Rich Doss Trucking company that they provided could not come up with stock after making an appointment after five weeks. PLEASE, PLEASE do yourself a favor and do not buy Trex. It is only good old nature made wood for me! I installed 500 sf of Trex Accents Saddle composite decking for a client in April of 2013. Within 6 months it started to mildew. The client cleaned the deck with the Trex recommended deck cleaner and it stayed clean for about a week. Then the mildew stains returned. I contacted my supplier who put me in touch with their Trex rep. The rep walked me through the process of making a claim. We sent all of the paperwork, sent them samples of the material we used, took photos...they flat out denied the claim. I will NEVER use Trex products again. A trex deck I had installed approx. 7 years ago at my mothers home in Washington state has not only discolored, molded, warped,and peeled, it is disentegrating into sawdust. In total, this deck cost me $20,000.00!! Trex is offering to replace the materials! and give me .18 per foot towards the cost of construction. Me living out of state, (in California) my mother passing away in Nov of 2010 has put me into a position of traveling back and forth, checking on the status of this deck. Sooooo now I have to pay to have this deck removed, and this deck replaced due to their faulty product. I am out $20,000.00 no matter which way I go. Advice?? Our 12 x 24 ft. deck started molding within a year-it took 21/2 yrs of persistence but our Lowes got involved and I did get a refund for just the boards- no labor refund or railing refund-but a little was better than nothing. Dealing with Trex was a joke-they could have cared less about anything-I would never recommend trex to anyone. Our deck is 6 yrs old and we just put another coat of stain on-our 3rd time-to cover the spots that show up again. So much for no/low maintenance that convinced us to get this in the beginning. I am sad for all who have the same problems-but please be persistant and keep bugging Trex, your contractor, or store you bought it from-it may help in the end. I got really lucky that the contractor I found on www.jobquotes.com actually told me about this tendency that Trex has before I bought it. He saved me a lot of headache! You haven't seen mold on A TREX decking until you have seen mine, 1200 square foot of decking pretty much have to be replaced and TREX will not take responsibility. The only thing they can tell me is to replace the deck with their new boards. Do they think I'm going to get screwed twice? We had three decks made with trex just over six years ago and they now look a total mess. It looks nothing like the original color, and doesn't resemble wood at all. The top of the handrails are growing a green hairy substance that looks like grass, intermingled with black patches. We are so disappointed with this product. I filled in a claim a couple of weeks ago with photos. Joseph Trink the file manager called me today and said there doesn't appear to be an issue with flaking, so Goodbye and have a nice day!!!! Is there any chance we can file another law suit. We bought this product because of its low maintenance promise and now left with the expense of replacing them. Is mold still an issue with Trex? Does all composite decking have their problems? We are just days away from building a new deck, when I came upon this site. I fear doing it with composite material now. Bleach is horrible for composite decks (and the environment). The previous posts about it and oxalic acid are pretty accurate. I am a chemist and work with composite decks. You may create a worse problem than you had and possibly ruin your expensive deck if you use bleach or acids. Look for a non bleach cleaner. There are also treatments to help protect the deck from mold/mildew and other stains (dont use a coating/paint or you will be in for a lot of work every couple years). We love a product called resist mist for composite decks (www.resistmist.com). Works for several years and recommended by some big deck manufacturers for remove mold, mildew stains from a composite deck. The images in this post are exactly what the product was designed to help eliminate. Like one of the previous members, we are working to create awareness that bleach is bad for composite decks and docks. We have Trex decking that is 12 years old now and we wish we never bought it. It is faded, covered in some kind of white solid "stuff" underneath the deck, and it has swollen which in turn has caused all the pressure treated joyces to rot. This product gets so hot in the Summer that you can burn the bottom of your feet and it smells like burning plastic. Initially started with mildew and black mold. I wasn't able to clean it completely and the deck looked like the color was bleached out. In addition, the deck has a orange colored fungus looking growth. it seems like it is growing from within. It not removed immediately and if allowed to dry, you need a putty knife to scrape it off. I ended up painting the deck in hopes to seal the surface. In part it worked, but wherever I missed like areas by the deck screw, the fungus will grow. I contacted Trex and filed a warranty claim. Now I'm waiting to hear from them. Can you paint or stain Trex composite decking that has a lot of black mole.